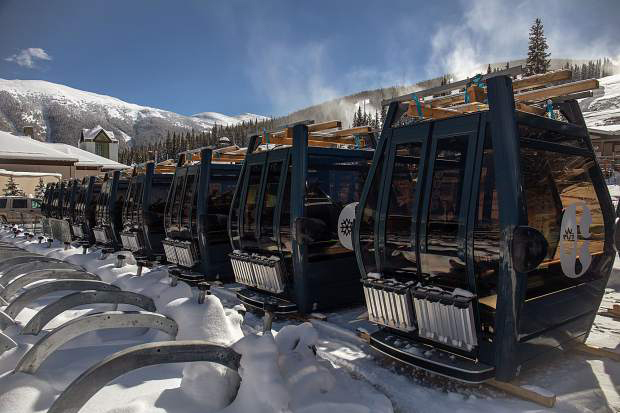 The gondola cabins for Copper Mountain Resort's new American Eagle lift in Center Village are seen at the resort earlier this month. One of the cabins on the new American Eagle lift in Center Village broke free during testing shortly after exiting the terminal and crashed to the ground on Monday. COPPER MOUNTAIN — A gondola cabin on the yet-to-open American Eagle lift at Copper Mountain Resort broke free Monday morning and crashed to the ground just after exiting the base terminal. A statement from the resort said the lift is currently under construction and the incident happened during testing. Because it was not open to the public, no one was injured. A review by Leitner-Poma, the manufacturer and construction contractor, indicated that no critical components were damaged and the resort does not anticipate any delays as a result of the mishap, the statement reads. The American Eagle Lift was a high-speed quad that the resort replaced with a Leitner-Poma high-speed lift earlier this year. It features a combo of six-person chairs and eight-person gondola cabins. The new lift is supposed to increase uphill capacity by over 40 percent.